It would be impossible in a Cathedral Church to be narrowly Presbyterian in outlook. In this Cathedral, the building speaks to us of our Celtic origins, the Roman Church, the years of the Reformation and the period of Episcopacy in the 17th Century. The congregation of St. Machar's feels itself to be part of the church catholic and understands Presbyterianism as simply a form of government. At the celebration of Holy Communion which takes place at least twice in each month, an invitation is extended to members of all branches of the Christian Church to participate fully. The approach to worship in the Cathedral reflects the full scope of the religious experience through a millennium and a half during which the name of the Lord has been recorded here. Music forms an important part of the fullness of worship. We seek unity with all Christians through our experience of the Holy Spirit. Through word and sacrament and the encounter with the Divine, we believe that religious diversity can be more enriching than threatening, as we seek in our Christian believing an ecumenism of both time and place in our growth together towards God. 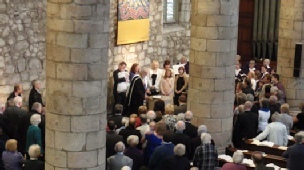 For centuries music has played an important part in the worship of St. Machar's Cathedral whose choir and fine Henry Willis organ fulfil a vital role in leading worshippers on Sunday mornings and on other occasions, and in enriching the service with liturgical music from a wide repertoire.